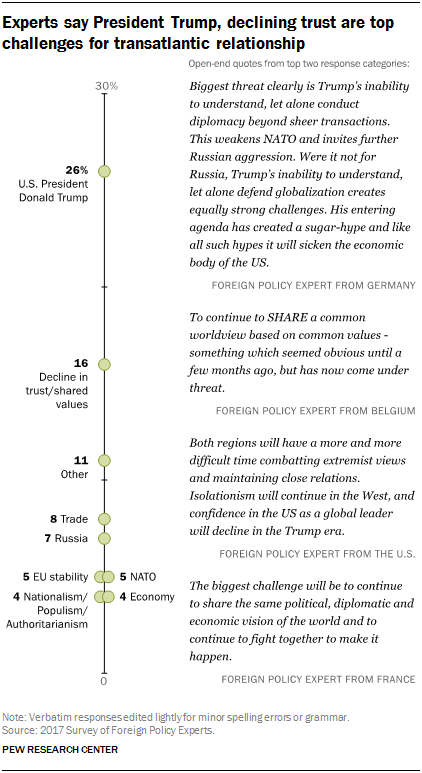 CORRECTION (Feb. 2018): A previous version of the section “Experts critical of Trump, see challenges for transatlantic relations” and the chart “Foreign policy experts and publics lack confidence in Trump and Putin” misstated Vladimir Putin’s confidence rating among foreign policy experts. These were revised on Feb. 27, 2018, to reflect Putin’s actual rating (8%). Pew Research Center surveys of transatlantic experts and general publics in North America and Europe reveal a division between these two groups over the role of the people’s voice in governing. While a median of 68% of the 12 publics surveyed say allowing citizens to vote directly on major national issues would be a good way to govern their country, just 37% of foreign policy experts surveyed agree. Foreign policy experts: The expert survey findings in this report are based on one institutionally defined expert community. The survey was conducted among invitees of the German Marshall Fund’s annual Brussels Forum and alumni of GMF’s fellowship and educational programs. These programs focus on the pressing global challenges facing both sides of the Atlantic. The survey was administered online from Jan. 18 to March 16, 2017, among 547 experts from Europe, the U.S. and Canada. General public: The results for the general public come from the 2017 Global Attitudes Survey. The medians cited are from the 12 transatlantic countries included: the U.S., Canada, France, Germany, Greece, Hungary, Italy, Netherlands, Poland, Spain, Sweden and the UK. The survey was conducted via telephone or face-to-face interviews from Feb. 16 to April 17 among 12,462 adults. For more details, please see Methodology section. 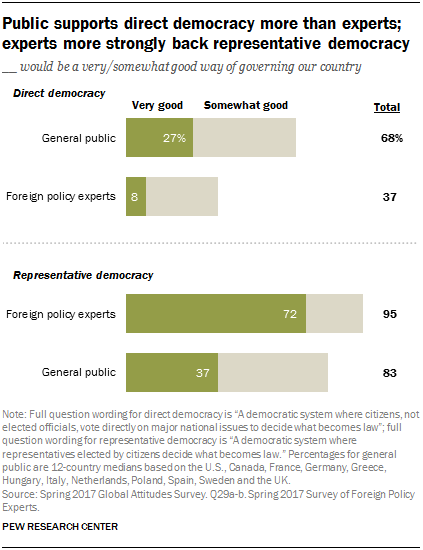 When it comes to the most common form of government in Western nations – representative democracy – both experts and the general public are broadly supportive. But the depth of public support is limited: A median of only 37% across the 12 nations polled describe representative democracy as a very good form of governance. In only one country – Sweden (54%) – do more than half express this view. Foreign policy experts convey a much higher level of commitment to representative democracy (72% say “very good”). Populist movements have ushered in new political actors on both sides of the Atlantic. Perhaps none is better known than the 45th president of the United States, Donald Trump. Among the foreign policy experts polled by Pew Research Center, nearly nine-in-ten (88%) say they lack confidence in Trump to do the right thing regarding world affairs. A median of 76% among the European and North American publics agree. 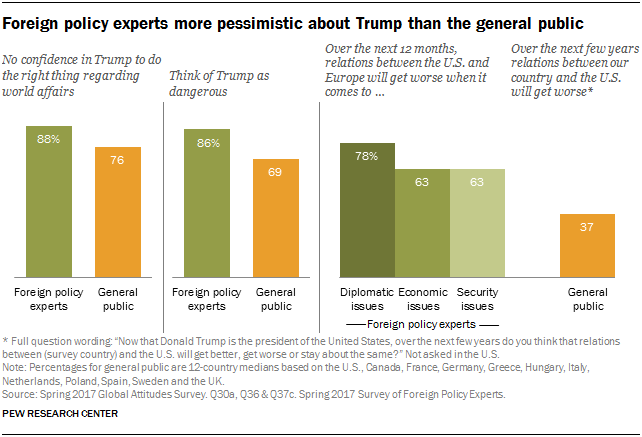 Nearly as many foreign policy experts describe Trump as “dangerous.” A median of roughly seven-in-ten across the publics surveyed share this view. But experts and the general public diverge on the consequences of Trump’s presidency. Many among the public (median of 51%) believe their country’s relationship with America will stay about the same over the next few years. Only 37% say it will get worse. Foreign policy experts are less sanguine: More than six-in-ten think that over the next year relations between Europe and the U.S. will worsen in the three areas asked about: diplomacy, the economy and security. More broadly, experts and the public see some of the same global threats confronting their nations. Of the eight international issues asked about, the public points to ISIS, climate change, and cyberattacks as their leading concerns, with the threat posed by the Islamic State topping the list. Foreign policy experts also express strong concern about ISIS, but fewer see the extremist group as a major threat than say the same about climate change, cyberwarfare or Russia’s power and influence. These are among the key findings from a survey of foreign policy experts and a large cross-national survey of 12 transatlantic publics, both conducted in the spring of 2017. The survey of foreign policy experts was a Pew Research Center study conducted in association with The German Marshall Fund of the United States. Nearly all foreign policy experts surveyed think that a democratic system where representatives, elected by citizens, decide what becomes law is a good way of governing their countries. Publics, too, generally embrace representative democracy. Positive evaluations of the system range from a high of 92% in Sweden to a low of 74% in Spain. In many of the 12 countries, people with more than a secondary education are more supportive of representative democracy. But while experts and publics are largely united in their support of representative democracy, they differ substantially with regard to the depth of support. Whereas 72% of foreign policy experts say it is a very good system of government, a median of only 37% among the public say the same. Disagreement between experts and the public arises when it comes to direct democracy. 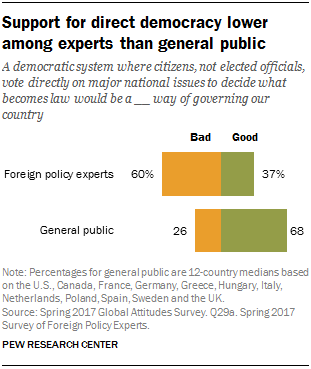 Only a minority of foreign policy experts (37%) think a democratic system where citizens vote directly on major national issues to decide what becomes law would be a good way to govern their country. In contrast, a median of 68% among transatlantic publics think direct democracy would be a good governance system. This ranges from a high of 74% in France and Germany to less than six-in-ten in the Netherlands (55%) and the United Kingdom (56%) – a country that is still adjusting to changes wrought by the Brexit referendum of June 2016. In about half of the surveyed countries, those with higher education levels are more likely to think direct democracy is a bad option for their country – bringing their views more in line with the experts surveyed. Among foreign policy experts, a minority (30%) supports a system of government in which experts make decisions according to what they think is best for the country. Public opinion on the benefits of government by experts largely mirrors the views of these experts. A median of 42% think it would be a good way to run their country. However, support varies considerably across Europe, ranging from a high of 68% in Hungary to a low of 31% in Greece. The U.S. stands out as the country in which the public is most likely to see this option as very bad for the country (31%). In most transatlantic countries, education has no effect on support for a technocracy. The U.S and Germany are the only two places surveyed in which those with higher levels of education are more opposed to rule by experts. Few transatlantic experts surveyed (4%) think their country would benefit from having a strong leader who makes decisions without interference from parliament or courts. Publics across Western Europe and North America are largely similar to the experts in their view that such an approach to government would be inappropriate; a median of 14% say rule by a strong leader would be good for their country. However, public support varies markedly across countries, ranging from a high of 29% of Italians who think an unchecked executive is very or somewhat good to a low of 6% in Germany. Across most of the countries surveyed, those with more education are more opposed to rule by strong leaders. Only 2% of foreign policy experts think military rule would be appropriate for governing their countries. Publics across Western Europe and North America roughly mirror experts, with a median of 11% saying they think a military government would be a good thing. Again, though, support varies across countries. Germany and Sweden are the least positive (4% each), while Americans, the French and Italians are the most (17% each). As with opposition to a strong leader, those with more education tend to be more opposed to rule by the military across most of the countries surveyed. Across Europe and North America, foreign policy experts express little confidence in the world leadership of U.S. President Donald Trump. Just 12% say they have a lot (1%) or some (11%) confidence in Trump to do the right thing regarding world affairs. Among the 12 transatlantic publics surveyed, a median of 21% say the same. Experts have similarly low confidence in Russian President Vladimir Putin. Nine-in-ten foreign policy experts (91%) say they have little or no confidence in Putin’s handing of world affairs. Only 8% say they have a lot (1%) or some (7%) confidence in Putin to do the right thing regarding world affairs. The general public is also relatively negative toward Putin, though slightly less than the foreign policy experts. A median of just 19% say they trust the Russian president, while 75% say they have no confidence in his decision-making. Most publics surveyed share this criticism of Putin, with the exception of Greece, where 50% say they have confidence in Putin’s foreign policy. German Chancellor Angela Merkel is the most highly rated among the three world leaders, with 93% of foreign policy experts expressing confidence in her decisions on foreign affairs, including 65% who say they have a lot of confidence. 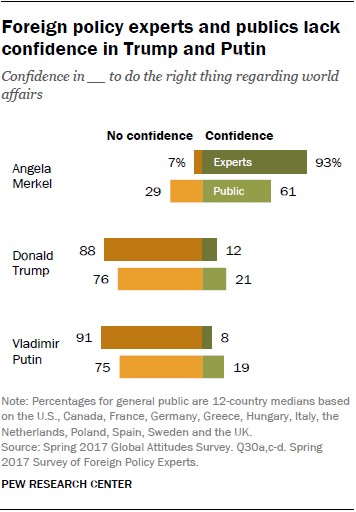 The publics surveyed also rate Merkel the highest for her world leadership, though their level of confidence is much lower than that of experts. A median of 61% across the 12 publics say they trust Merkel to do the right thing in world affairs, while 29% say they do not. Again, the Greeks stand out – just 16% have confidence in Merkel. 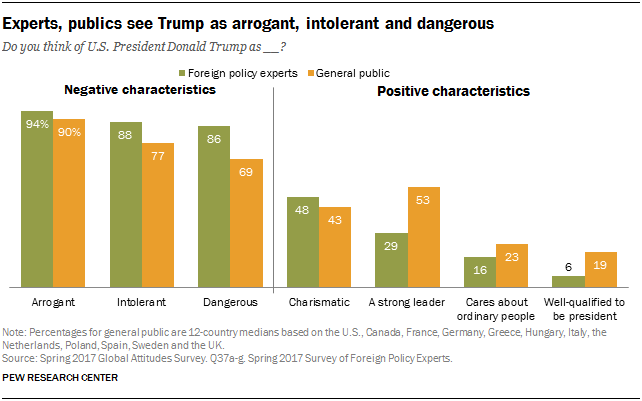 While foreign policy experts and publics express similarly low levels of confidence in President Trump, experts tend to be less forgiving than the general public when it comes to describing the American leader’s key characteristics. Majorities of both the experts and publics surveyed believe that each of the negative traits asked about applies to Trump. Still, an overwhelming percentage of foreign policy experts are critical of the president, with more than eight-in-ten describing him as arrogant (94%), intolerant (88%) and dangerous (85%). Smaller majorities within the general public agree. In many countries, respondents with more than a secondary education tend to be more negative about Trump’s characteristics than respondents with less education. When it comes to positive traits, few foreign policy experts surveyed say Trump is a strong leader (29%), cares about ordinary people (16%) or is well-qualified to be president (6%). Among the attributes asked about, the positive one that foreign policy experts most think Trump exhibits is that he is charismatic (48%). A higher percentage of the general public assigns Trump each of these positive traits, with the exception of charisma. The most commonly cited positive characteristic among the general public is that the U.S. president is a strong leader (53% median). Concerns about President Trump’s leadership appear to have taken a greater toll on foreign policy experts’ views of the future than on the publics’. 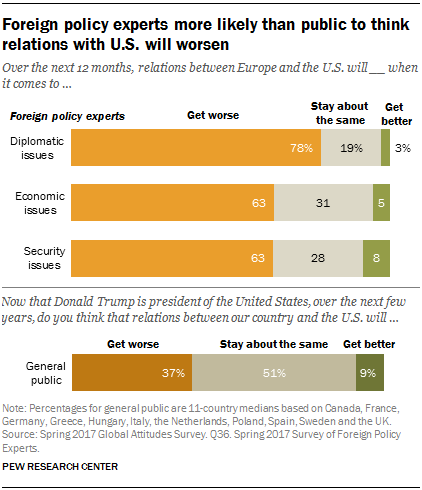 A majority of the foreign policy experts surveyed say that relations between the U.S. and Europe will get worse over the next 12 months when it comes to the areas of diplomacy (78% worse), economics (63%) and security (63%). Transatlantic publics, on the other hand, are much less worried about the future of relations with the U.S. Pluralities or majorities of nine of the 11 publics surveyed outside the U.S. think that now that Trump is president, relations between their country and the U.S. will stay the same over the next few years. A median of 37% across all 11 countries expect relations to worsen, while just 9% believe things will get better. Germans are the most pessimistic (56% expect worsening). When foreign policy experts were asked in an open-ended question what will be the biggest challenge for relations between the U.S. and Europe in the coming year, the top answer offered was U.S. President Donald Trump (26%). The second most common challenge cited was a decline in trust and shared values (16%). One of the biggest foreign policy challenges that Europe and the U.S. have faced in recent years has been Russia’s role in Europe. With the annexation of Crimea in 2014 and subsequent tensions with Ukraine, NATO member countries that border Russia, such as Poland, were concerned about the threat posed by Moscow’s actions. Article 5 of the NATO treaty requires member countries to come to the aid of a NATO ally if they are attacked by a foreign power. In 2015, a majority across the seven NATO publics surveyed were confident that the U.S. would fulfill its duty to Article 5 if a military conflict with Russia arose (median of 68%). Today, a similar majority across 10 NATO countries (median of 64%) say the same. Foreign policy experts, however, are less optimistic about the American commitment to Article 5. Half of the experts surveyed say the U.S. would use military force to defend a NATO ally in a conflict with Russia. But a nearly similar percentage (46%) think the U.S. would not do so. Experts and the public alike are worried about the impact of global climate change, cyberattacks from other countries and the militant group ISIS. 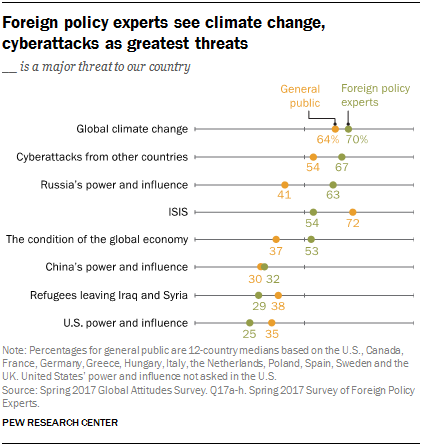 Climate change is the top concern among the foreign policy experts surveyed, with 70% describing it as a “major threat” to their country. These experts are similarly concerned about cyberattacks from other countries: 67% say digital attacks are a major threat. Rounding out foreign policy experts’ top three concerns is the impact of Russia’s power and influence on their countries, with more than six-in-ten (63%) describing Russia as a major threat. The public is much less concerned about the impact of Russia on their country (median of 41%). For the public, the top concern is ISIS, with a median of nearly three-quarters (72%) describing the group as a major threat. The public also ranks climate change as a top threat (median of 64%). The southern European countries of Spain and Greece are particularly concerned: Large majorities of the Spanish (89%) and Greeks (79%) describe climate change as a major threat to their country. Transatlantic publics’ third-highest concern is cyberattacks from other countries, which 54% consider a major threat. Still, this is 13 percentage points less than foreign policy experts. Concern about cyberattacks is strongest among the U.S. public, where 71% describe such attacks as a major threat. Experts and the general public differ over the impact of the global economy. More than half of the foreign policy experts (53%) express major concern about the potential for the condition of the global economy to negatively impact their country. In contrast, just over one-third of the public (37%) holds similar concerns. The biggest exception is Greece, where 88% of the public sees the international economy as a major threat.